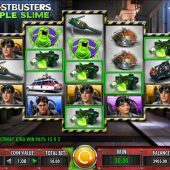 Ghostbusters Triple Slime slot, it may not surprise you to learn, is a sequel to the original IGT Ghostbusters game. Like its predecessor, Ghostbusters Triple Slime made its name first in land-based casinos before being released online by IGT. All the characters from the original 1984 Movie appear in the time-honoured IGT 720 Multiway Xtra format with 5 reels of 3-4-5-4-3 rows respectively that pay both ways. Naturally the famous Ray Parker jr. soundtrack plays while the game is open, and luckily it's one I actually like so wasn't too tiring! When doing the 'heartstopper' spins where 2 scatters are in view you get the backpack 'zapper' effect over the reels too. So will this turn your balance in to a ghostly shadow of itself? There are no free spins but instead there are two wheel bonuses, straight out of IGT's Wheel Of Fortune Triple Extreme slot. Should you get 3, 4 or 5 slimer green Ghosts anywhere in view, the 'Slimer Scatter Bonus' occurs and each scatter will reveal a wheel with coin prizes which vary according to the reel the slimers land. Reel 1's wheel has values of 10-100 coins and these rise in stages to reel 5's which offers 100-2000 coins which is only 2-40x stake as you bet 50 coins per spin. So you get to spin these wheels according to which scatters landed on which reels. The second wheel bonus, the Triple Slime Bonus, occurs when 3 or more bonus power pack scatters appear on reels 2, 3 and 4. These are stacked 2 rows high so you can trigger with just 2 of those 3 reels. You reveal different colour pointers (green, purple and red) which each get placed on a different coloured wheel. The purple wheel pays values of 0.6 to 20x stake, the green wheel 2 to 100x stake and the red wheel is a multiplier of 2 to 10x. You aren't guaranteed with your minimum 3 picks to choose any combination - so you could get 3 purple pointers, pretty poor return or say 2 green and one red giving you 2 cash prizes to be added then multiplied on the red wheel. So you could with the above scenario get 2 maximum 100x awards on the green and then get a 10x multiplier on the red for a 2000x stake win, but believe me this is highly unlikely as the returns tend to be quite low.